If you are making the chicken salad, mix the chicken, celery and onion in a bowl. Thin the mayonnaise with a little milk, and pour over the chicken. Toss and add salt and pepper to taste. This recipe makes a thin mayo dressing, don't thin it down if you like it thicker. To make the herbed dip, put the mayonnaise and the herbs in a wide mouthed mason jar or similar jar, and squeeze in the citrus juice. Use an immersion blender to blend together until smooth. Add salt and pepper to taste. Roll up the chicken salad just like you would a burrito, tucking in the two sides, and keeping everything nice and snug as you go. Slice the rolls in half with a very sharp knife, and serve with the mayo dip. 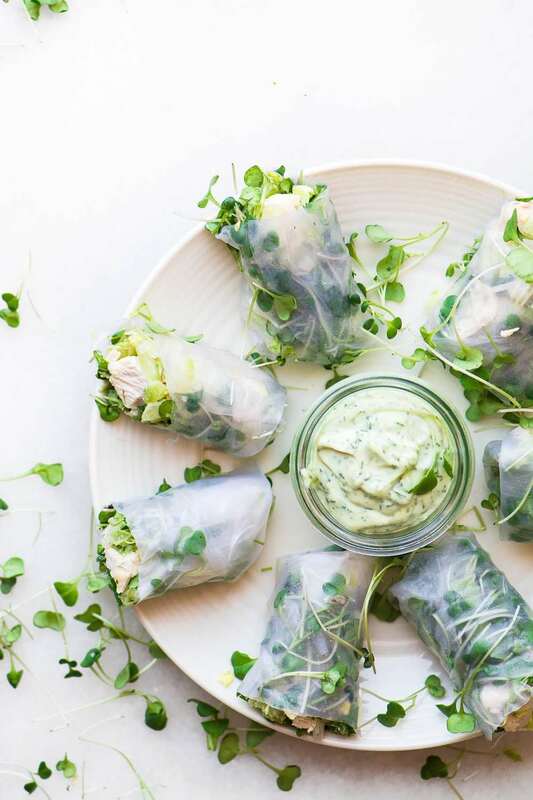 If you want to make these a few hours ahead, put them on a plate so that they don't touch each other (the rice paper wrappers will stick) and cover with a damp cloth. Cover the cloth with plastic wrap and keep refrigerated.